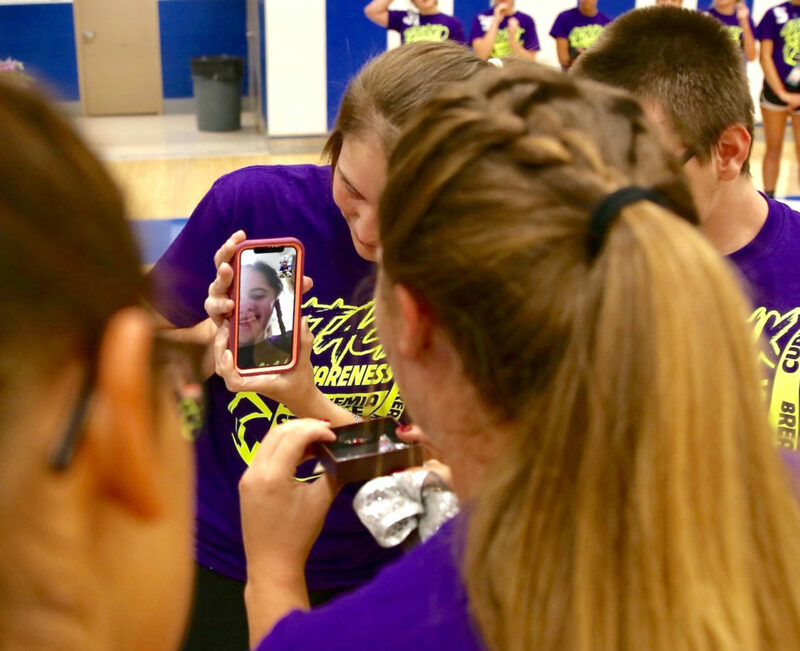 Special to the Journal/Jimmy Joe Savage Beaver Local volleyball player Lauren Thomas, who is recovering from a stroke suffered in July, showed up on FaceTime via Kaylyn Cochran’s phone to accept a gift presented by East Liverpool’s captains Terran Stacey, Skye Stokes and Emma Ludwig on Thursday. as the Potters and Beavers faced off at Potter Fieldhouse. EAST LIVERPOOL — The East Liverpool and Beaver Local volleyball team rallied around community members going through some hard times on Thursday during action at Potter Fieldhouse. The rivalry match went the way of the Potters 25-16, 25-11, 25-22, but a lot of good was done by what was deemed the “Attack for Awareness of Stroke and Cancer” match. For the Potters (8-1), Skye Stokes had 12 kills and four aces. Emma Ludwig had eight kills and four blocks. Terran Stacy had three kills and two blocks. Sharnae Wilson added three blocks. For the Beavers, Hannah Call had five digs. Karlee Furman chipped in four kills. Kinzie Galeoti had five digs. Elaina Howell added nine assists and four digs. Madison Kendall had eight assists and three digs. Madison Smith had nine kills, while Cierrah Thurik had five digs. Heavyn Wolski had two kills and two digs. Beaver Local won the jayvee match 25-27, 25-20, 27-25. Grace Hill had 10 kills. Eli Kolkowski had eight kills. Alannah Boyd had 15 assists, five digs and nine points. Brooke Schwerha had two aces, 13 assists and 12 points. East Liverpool hosts unbeaten Crestview on Saturday. Beaver Local hosts Edison on Monday. COLUMBIANA — Crestview made short work of Newton Falls in a 25-7, 25-23, 25-19 win on Thursday in All-American Conference play. Crestview is 9-0 and 5-0 in the conference. For the Rebels, Emily Emch had 14 kills and three blocks. Brenna Auer had 11 kills and two blocks. Molly Emch added seven kills and two blocks. Natasha Salmen had 23 digs. Anna Gorby had 19 assists, while Haley Eskra had 15 assists. Crestview won the jayvee portion 25-12, 25-10. Shelby Rambo had five kills. Cassie Cope added nine points. Crestview is at East Liverpool on Saturday. BELOIT — West Branch’s volleyball team improved to 8-4 with a 25-7, 25-5, 25-12 victory over Alliance on Thursday. For West Branch (8-4, 3-3 in Eastern Buckeye Conference), Jenna Rockwell had 11 points, three aces. while Riley Tuel had 10 points and 10 kills. Elise Wallace provided 20 assists. West Branch won the jayvee portion, 26-24, 25-20. Bailey Campbell had 10 points and two aces. Kaitlyn Greiner had five kills. WELLSVILLE–The first-place Wellsville volleyball team continued to roll with a 25-9, 25-11, 25-14 win over Toronto in Eastern Ohio Athletic Conference action Thursday. 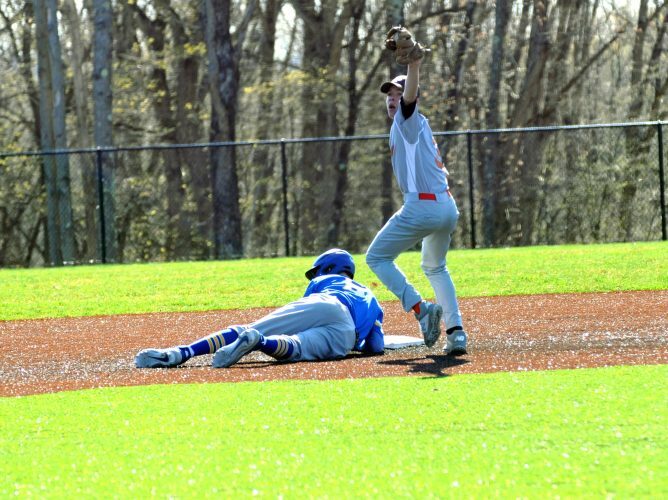 The Tigers are now 10-1 overall and 8-0 in the EOAC, one game ahead of second-place Southern. For Wellsville, Regan Pierson had eight kills and 22 assists, Delaney Cochran had five aces and seven kills, Kinley martin had 14 kills and four aces, Jenna McNicol had 17 digs and one ace, Greta Cartwright had 13 assists, Delaney Cochran had five aces and seven kills, Emma Smith had seven kills and Peyton Davidson had five kills, three aces and two assists. Wellsville won the jayvee match 25-10, 25-10. Paige Green had five kills and eight assists for the Tigers, while Emily McNicol had five aces, three kills and 10 assists. SALINEVILLE–The Southern volleyball team dispatched Leetonia 25-9, 25-13, 23-25, 25-17. The Indians are now 10-1 overall and 7-1 in the Eastern Ohio Athletic Conference. The Bears are 0-10. For the Indians, Hannah Hayes racked up 17 points, 10 assists and four kills, while Riley Felton had 12 points, 12 kills and 10 blocks. Delainey Mellott added 15 points and eight digs. Cheyenne Utt rounded things out with 10 points. For Leetonia, Elyssa Jones had 11 assists, six digs, four points and two aces. Emma Kemp had 15 digs, three points, two aces and three kills. Megan Rosko had 10 digs, five kills, five points and two aces. Leetonia won the jayvee match 25-21, 25-21. For the Indians, Marissa Stewart had 10 points. Sophia Beatty had three kills. EAST PALESTINE–The East Palestine volleyball team took care of Columbiana 25-17, 25-20, 25-9 Thursday. The Bulldogs even their record at 6-6 overall and 4-4 in the Eastern Ohio Athletic Conference. The Clippers fall to 3-7, 3-5. Madie Foster led the way with nine kills and 32 digs. Madelyn Hostetter added 12 points, six digs and three aces. Paige Snyder had five kills, while Emily Berger had six blocks. For the Clippers, Maci Linhart finished with 14 digs and seven points. Abby Parish added eight digs, while Grace Witmer had five digs, five assists and four points. East Palestine won the jayvee match 25-8, 25-11. HANOVERTON–Lisbon handed United a three-set defeat Thursday in Eastern Ohio Athletic Conference volleyball action. For Lisbon, Maddie Liberati had 13 points, four aces, 16 kills, and four blocks. Corinne Freeman chipped in seven points, eight kills, and nine blocks. Hailee Carpenter had seven points, 26 assists and 6 digs. Chloe Smith had three points, eight digs and four kills. United was led by Rachel Bowen with seven kills, two blocks, and three points, while Haley Dees had 11 assists and Tori Tschappatt had 5 kills. United takes on Minerva Monday. NEW MIDDLETOWN–The Springfield volleyball team continued its march through the Mahoning Valley Athletic Conference with a 25-12, 25-7, 25-10. The Tigers are now 9-2 overall and 7-0 in the MVAC. Jennie Stitzel finished with 17 points and five blocks for Springfield, while Lyndsey Smith had nine kills and five blocks and Carly Stitzel had 10 kills. Kaelen Yemma dished out 25 assists. Defensively, Lauren Ranelli led the way with 21 digs. Ellie Centofanti added 13 points. GREENFORD–The South Range volleyball team turned back Struthers Thursday 25-27, 25-17, 23-25, 25-21, 15-11. For the Raiders, Abby George was a force around the net with 23 blocks and seven kills. Emily Irons had a strong all-around game with seven kills, nine assists, 15 digs and two aces. Drew Feren added 16 assists and six blocks.